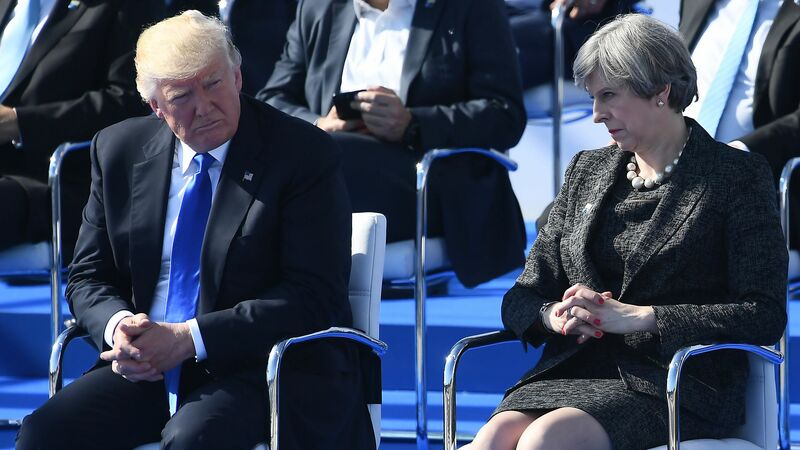 You've already read a hundred stories about President Trump's clashes with some of America's closest allies at the G7 summit in Canada. But we've got new details from his private conversations with heads of state that have put some of these leaders on edge leading into next month's NATO summit. What we're hearing: In one extraordinary riff during his meeting with the G7 heads of state earlier this month in Quebec, Trump told the other leaders: "NATO is as bad as NAFTA." An official read this quote to me from notes transcribed from the private meeting. Then Trump said of the NATO Summit on July 11-12 in Brussels: "It will be an interesting summit. NATO is as bad as NAFTA. It's much too costly for the U.S."
Why this matters: NATO member states are worried about Russian aggression and they want an unambiguous sign that America has their back. By linking NATO to NAFTA — a trade deal that Trump considers an unmitigated disaster for America — Trump reinforced some of the Europeans' worst fears that he'll take a purely transactional approach to next month's summit. Officials from four NATO member countries have told me they're worried Trump undercut the shared values and commitments of the NATO alliance by spending most of his time bashing NATO members for not "paying enough" and meeting their defense spending commitments. Trump is broadly correct about the defense spending. Many NATO members have been shirking their responsibilities and are nowhere near their promise to spend 2 percent of their Gross Domestic Product on defense. Trump, the official said, could point out that NATO members have been increasing their defense spending, and say that it's only because of his pressure. The official said he hoped — but wasn't confident — Trump would take this gentler, more diplomatic route. 1 fun thing: In the same meeting, Trump cracked to the leaders about what was then his upcoming Singapore summit with Kim Jong-un. "It's like baseball," Trump told the G7 leaders, according to the source reading from the meeting notes. "You never know if you are going to hit the ball." How Trump could reassure America's NATO allies. Get more stories like this by signing up for my weekly political lookahead newsletter, Axios Sneak Peek.